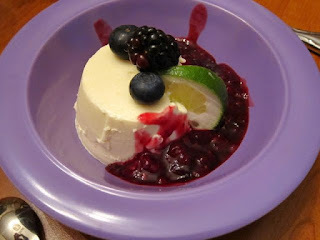 For the panna cotta, I made half the recipe since I only had four ramekins. This set up in the fridge while I prepped for dinner. [2 cups heavy cream, 1/4 cup sugar, heated in the microwave until very warm. Add 1 tsp. vanilla. Mix 1 packet unflavored gelatin with 3 T. cold water, pour the hot cream over it and stir. Chill in oiled ramekins for at least 2 hours.] The compote was blackberries and blueberries mixed with 4 T. lime juice, 1/3 cup of sugar, and simmered for 15 minutes (based on Hank Shaw's mulberry key lime compote). Then I added the cornstarch and cooked it 5 minutes more and let it cool. 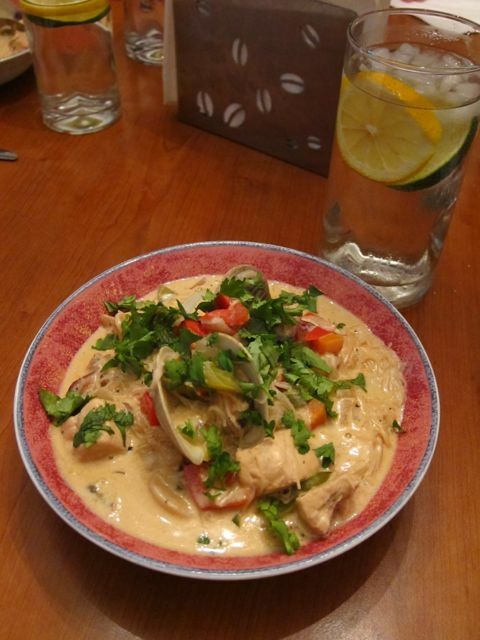 To make the stew, I started with the chowder recipe but changed the fish and added rice noodles. Before I ran a few errands I chopped 1 red pepper, 1 green pepper, 3 carrots, 1 onion, and some garlic, and set it aside. I had bought half a pound each of swordfish, scallops and squid and a pound of little necks. I cut the scallops in half, chopped the squid and swordfish and cleaned the little necks and set everything aside. To the sauteed vegetables and spices I added 1 pint of lobster stock, 1 pint of light cream, and 1 can of coconut milk. I did not add the tomato paste because the lobster stock had been made with a tomato base. Once I got everything simmering, I added all the seafood except the little necks and simmered for 5 minutes. Then I added the little necks and a package of rice noodles and simmered for 12 minutes until the little necks opened. It tasted amazing and, because the noodles absorbed a lot of liquid, became more of a stew than a chowder. Garnished with parsley and cilantro, it was a very filling meal. Getting the panna cotta out of the ramekins was a little challenging but I finally got the hang of it. A little compote spooned around it and some garnish, and voila! Perfection.